The first service, Morning Prayer, was conducted by John T. Cooper, a seminarian at the Episcopal Theological Seminary in Kentucky, on December 9, 1956, in the Kentucky Utilities auditorium ,with thirteen persons present. Mr. Cooper would remain at the mission for the next eighteen months. Beginning in 1957, services were held in the waiting room of John Hill, MD. Dr. Hill was the first confirmand at St. Patrick Mission, being confirmed by Bishop Moody on April 14, 1957. Hugh Fuller served as the first Bishop’s Warden. The minutes of 1957 reflect four confirmations, one baptism, 24 known adult communicants, eighteen baptized children, fourteen families and that Mr. cooper received $50.00 a month. The Fox/Gibson House, the present parish house, was purchased in the summer of 1958 for $20,000. The parlor of the church was transformed in to a chapel. Trinity Church, Danville donated the pews, and the altar cross of black walnut was made by Fred Boss, father of Ed Boss. An old pump organ was donated and run by a vacuum cleaner motor. This motor was mounted in the basement and made loud noises when the motor was turned on. Millie Dickinson played the organ and Hugh Fuller led the singing. The loud motor was immediately switched off at the end of each song. Holy Communion was celebrated once a month and Morning Prayer the other three Sundays. From 1960 to 1970, the first full decade of the existence of St. Patrick Mission, attendance increased to the point that the need arose to expand and build a new church. 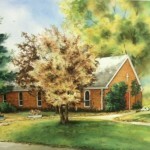 In 1963, the lot next door to the Parish house was purchased for $3000.00. Under the guidance of Senior Warden Jack Hill and vestry member Richard Cooper, a blueprint for the church was approved in April, 1966, and in August, 1966 a construction bid was accepted for $19,445.00 The Right Reverend William Moody came to St. Patrick on July 10, 1966 to break ground for the new church. Also during this decade of growth and change, the Ceramics of St. Patrick’s., a group of ladies led by Juanita Hopper, was busy changing the way the United Thank Offering would do business. The UTO offering is used world-wide for missions. This group of ladies designed and made the famous “Blue Box”, a ceramic blue box that would for years be used throughout the United States to collect offerings for world-wide mission development. Proceeds from the sale of these boxes provided funds for many needs of the St. Patrick for years. Production of the ceramic blue boxes continued up through the mid-1980s. The first service in the new church building was Christmas Eve, 1966, with the Reverend Richard Halladay officiating. The building, which is in use today, was officially dedicated by the Right Reverend William Moody on May 28, 1967. The first baptisms were Donald Ernest Lunsford and Orviille John Stein, Jr. The Reverend Arthur Chard and his wife, Judy, came to St. Patrick in July, 1968. Reverend Chard would be the guiding shepherd for the faithful over the next thirteen years, during twhich the membership would double and the amount pledged quadruple. The 1970s would be a time of growth at St. Patrick Mission. In July, 1970, with the blessing of Bishop Moody, St. Patrick Pre-school was started in the Parish house. By the end of 1972, the congregation was booming with attendance hitting an all time high. The number of communicants increased by 43% and there were 132 baptized members. There were nine acolytes, six lay readers, two organists and an active altar guild. the Women of the church continued to raise money through bazaar, bake sales and ceramics. St. Gregory choir, with thirteen members, was reaching out to sing at local nursing homes and presented evensong at St. Mildred Catholic Church. Indeed, by 1974, church income had almost doubled over the previous five years. Talk started about St. Patrick becoming a parish. Also during the 1970s, two members of St. Patrick would pursue Holy Orders. Bruce Boss, a “son of St. Patrick” was ordained a deacon on June 1, 1974. Orville John Stein, Jr. was ordained to the perpetual diaconate on March 15, 1975 at St. Patrick.